A patient presents to the office because of pain in the knee with or without a history of injury. An examination is performed followed by an X-Ray. Osteoarthritis may or may not be seen on the X-ray. If there is an altered range of knee motion when compared to the “normal” side, then a preexisting condition is considered. Whether or not the physician considers arthritis, an MRI is requested. The MRI report 48 hours after imaging is consistent with a torn medial meniscus. Should all patients with a torn medial meniscus undergo surgical intervention? If surgery is undertaken, should the procedure be a repair or a partial removal? The management of meniscal injuries must be influenced by the knowledge that meniscal integrity is important in load distribution across the joint. Meniscal injury causes altered joint mechanics and is related to the onset of arthritis. According to a recently published online article in the British Journal of Sports Medicine, arthroscopic partial meniscectomy (APM) may not be the best option for all patients with knee pain and meniscal tear. Researchers investigated patients with meniscal tears that compared Arthroscopic Partial Meniscectomy to nonsurgical intervention, pharmacological intervention, and no intervention. At six to 12 months, APM patients had a slight improvement in knee pain, knee-specific quality of life, and knee function compared to physiotherapy patients. When excluding osteoarthritis (OA) patients, the aforementioned outcomes exhibited small to moderate improvement. Knee pain, function, and quality of life did not improve for APM patients compared to placebo surgery patients at six to 12 months regardless of OA status. There may, however, be a small-to-moderate benefit from APM compared with physiotherapy for patients without osteoarthritis and who have mechanical or obstructive signs. 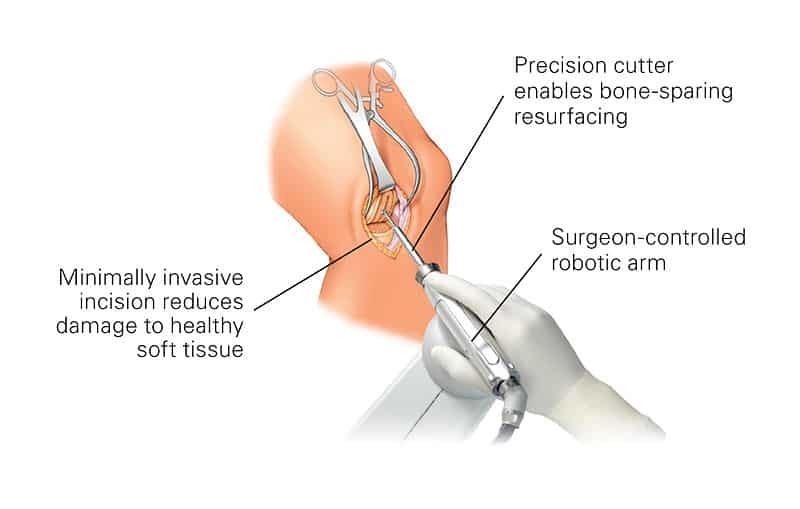 Arthroscopic partial meniscectomy (APM), a keyhole surgery where loose and fragmented pieces of a torn meniscus is removed, is one of the most common orthopedic procedures performed. Over half of these are performed to treat a meniscus tear in a degenerative knee; however, several recent randomized trials have shown that Arthroscopic Partial Meniscectomy is not superior to conservative treatment or placebo treating meniscus tears associated with a degenerative knee. On the other hand, there is universal agreement that the traumatic meniscus tear, the result of a knee injury in a younger patient with otherwise healthy knee (with no degeneration), should be treated by surgery. Then what is the downside of meniscal injury and surgery? The medial and lateral meniscus together provide shock absorption, establish a broad base of contact surface and help provide stability to the knee. Those who have undergone total or partial meniscectomy should understand that in five to 15 years, they will develop degenerative arthritis. The long-term outcomes of those whose tears were treated by repair rather than removal has not been established. My Regenerative Medicine practice in part, is the result of those seeking to postpone or avoid a Total Knee Replacement years after a meniscal injury followed by arthroscopic surgery. As long as the arthritis has not progressed to a Grade 4, I am able to assist the patient with joint restoration, at times joint regeneration, it is matter of age and health. While I am able to offer joint restoration, on occasion, joint restoration for those who sustained meniscal and Anterior Cruciate injury in the past, is there anything that could be used as an adjunct at the time of the meniscal injury to promote healing without surgery or postpone, perhaps avoid future postraumatic arthritis? To learn more. Schedule a consultation (312) 475-1893.You may view my web site at www.sheinkopmd.com.